This past Sunday, the girls and I drove to Greenville, North Carolina for an afternoon cookout. The commute was about an hour long each way, which was plenty of time to continue exposing them to the galactic drama known as Star Wars. As of this writing, we have successfully finished episodes IV, V, and VI. Despite their being considered "old movies," they wanted more. On this particular day, we would go back into time before there was a Luke Skywalker, Han Solo, Chewbacca, or Princess Leia. We started with episode I, which I explained would answer their single most asked question, "How was Darth Vader made?" The ride was relatively quiet both to and from Greenville. As we neared the end of our trip, my car started acting haywire. The "check engine" light beamed a bright amber color on the dashboard panel while steam escaped through the car's radiator. "We've been hit!" I yelled. Skillfully, I navigated into the nearest gas station where the car quickly rested in silence. In that moment, what started as a beautiful, fun, and carefree afternoon, immediately turned gray. I could feel the anxiety intensify as I wondered what was wrong? How bad would it be? How much would it cost to fix? What will I do with the kids? How will I get my car home? Why now? Why me? Not trying to scare the girls, I assured them that everything would be OK. 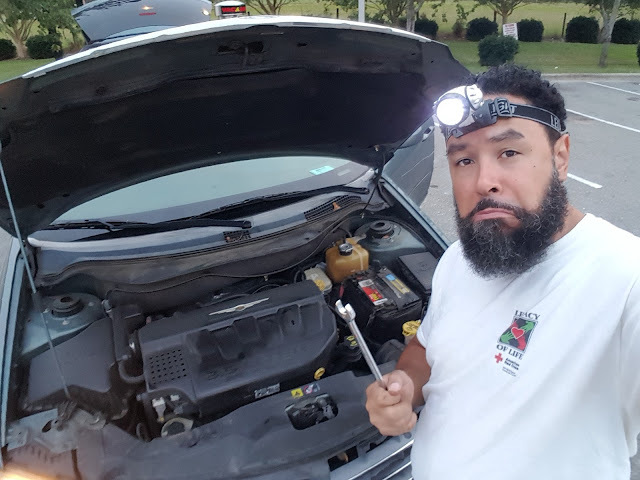 I opened the hood to find that my radiator hose had fallen off again and was now spewing steaming hot translucent green coolant all over the engine. Without any tools to aid in our rescue, I wondered how successful I would be if I tried to force the hose back on the radiator. I'll save you the suspense, that idea lasted all of 5 seconds because I was quickly reminded of how hot the engine, its fluids, and hoses can be after driving 60 minutes at 80 miles per hour. For a moment, I felt powerless. What now? I asked under my breath. Then, it dawned on me that there was a car part store about a half a mile away. If I could only figure out how to get there and back before it grew dark knowing that I would also be dragging a 9 and 11 year old behind me. After a quick huddle filled with lavish encouragement, the girls and I started our treacherous journey through the busy streets near I-95. For a second, I thought we were playing a real life version of Frogger. Over the next 45 minutes, we scaled jungle like terrain, avoided speeding cars and dangerous looking hitchhikers. In that time, we were able to purchase all of our supplies, borrow the necessary tools, and fix what needed to be corrected. With huge smiles and dirty hands, we headed home again. Then, seven minutes later, the car started overheating again. What? I just fixed it! I yelled at myself. Why is this happening to me? I was frustrated, confused, impatient, and fearful of the unknown. What if I couldn't fix it? What if my car had finally given up the ghost? What does this mean? Ugh! After inching home with a wet trail of antifreeze to mark my path, I finally realized that I hadn't put the hose on completely. With a quick adjustment and a full reservoir of coolant, I was back in business. Reluctant to celebrate too early, I completed a series of short tests that resulted in a growing level of confidence that all was back to its last known good. "Thank you, Jesus!" I sang boldly. As I look back over the stressful events of the day, I experienced a wide range of emotions. My mind went from one extreme to the other and I wasn't sure if we were going to have a happy ending. I questioned the timing, the purpose, the problem, and the solution. I was a mess inside. Let this story serve as a reminder that you are a champion, a conqueror! Stay strong and courageous knowing that you will get through even this storm. No matter how hopeless, dark, and impossible it may seem, have faith that God will see you through.